It was this day in (July 29) back in 1968 when the very first chicken wing was served and that is why today is National Chicken Wing Day. The story goes that Anchor Bar owner Teressa Bellissimo decided to fry up some chicken wings with some butter and hot sauce when her son and his college friends wanted a late night snack after a night of drinking. Because they were in the city of Buffalo, NY, the name buffalo wings stuck and that's when the almighty buffalo wing was born. I guess that's why chicken buffalo wings are a common staple and appetizer found in many bars and restaurants across America. Buffalo wings are definitely great when paired with a nice, tall glass of your favorite beer - lagers, stouts, ambers, ales, etc. If it weren't for Mrs. Bellissimo, we wouldn't have a Wingstop or a Buffalo Wild Wings. If you love buffalo wings like I do, then you should check out America's Test Kitchen's recipe for some good buffalo wings! Keep this date in mind when football season kicks off. 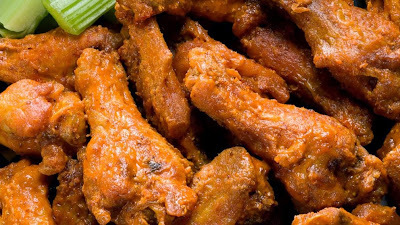 Many people in the United States are sure to consume many wings when watching NFL or college football games.